the round, usually red face, with large jowls, seen in Cushing disease or in exogenous hyperadrenocorticalism. 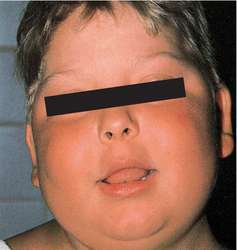 The round, puffy face seen especially in Cushing syndrome. a condition characterized by a rounded, puffy face. It occurs in people treated with large doses of corticosteroids, such as those with chronic asthma, rheumatoid arthritis, or acute childhood leukemia. The features return to normal when the medication is stopped. Moon face is symptomatic of Cushing's disease and Cushing's syndrome. Also called moon facies. A rounded face with a double chin, prominent flushed cheeks, and fat deposits in the temporal fossa and cheeks, which is typical of Cushing’s disease/syndrome and cri-du-chat (5p-) syndrome; the name also refers to a broad, round face with bright-red cheeks which is seen in well-developed, broad-chested children with pulmonary valve stenosis and a right-to-left shunt. The honored guest at a Northeastern University banquet two years ago, Ali sat dozing, his rigid moon face drooping on his chest. Ant, or perhaps it is Dec, lifts his little moon face and with that trademark grin prepares to grill the latest narrow loser. Howard Wright On Monday: It's a racing jungle out there .. Her moon face was trimmed of its usually chubby cheeks while her slack chin was levelled off. In this context, President Moon faces a herculean task of mediating dialogue between North Korea and the U. Moon faces working with a fractured parliament where his Democratic Party holds 40 percent of the single-chamber, 299-seat assembly, which will likely mean difficulties and deals to pass bills. Some of the patients also allegedly developed moon faces, a usual side effect of longterm use of steroid medications. This is because the Moon faces the Earth constantly. For more call 09050 700 440 Virgo August 23 - Sept 22 LOVE is in the air as the Moon faces up to Neptune and Venus, better put by saying love issues are in the air perhaps.